FILE - A soldier gives a thumbs-up sign as Turkish army's armored vehicles and tanks roll into the Syrian town of Ayn al-Arab, Feb. 22, 2015. The Turkish foreign ministry says it has summoned Russia's top diplomat in Turkey over the killing of one of its soldiers that has been blamed on a Syrian Kurdish group that Moscow is supporting. The dispute is putting increasing strain on rapprochement efforts between the countries. The Russian charge d'affaires was summoned Thursday by the Turkish foreign ministry and warned that Turkey will retaliate against a Syrian Kurdish group if there is a repeat of Wednesday's cross-border attack. The Turkish military claims that a sniper of the the YPG, a Syrian Kurdish militia, killed one of its soldiers. Turkish foreign ministry spokesman Huseyin Muftuoglu said in his weekly press briefing that Moscow was responsible for preventing such instances as its forces are deployed in the Kurdish-controlled Afrin region to monitor and prevent such occurrences. “Steps that should be taken in order to prevent similar cases in the future" and a reprisal would be aimed at the Syrian Kurdish group if such an attack was repeated, said Muftuoglu. 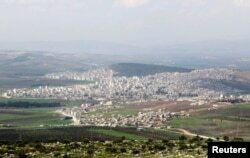 A general view shows the Kurdish city of Afrin, in Aleppo's countryside, March 18, 2015. The Turkish army regularly shells Afrin, accusing the YPG and its political wing the PYD, of being terrorists, affiliated with the PKK, which is fighting the Turkish state. But Moscow has been courting the Syrian Kurdish groups. This week, Russian forces were deployed in Afrin, despite protests by Ankara. The deepening dispute is casting a shadow over efforts to foster reconciliation between Ankara and Moscow, following a collapse in relations in 2015 after Turkish jets downed a Russian bomber operating from a Syrian airbase. Former senior Turkish diplomat Aydin Selcen, who served widely in the region, says the latest dispute over Afrin reveals the limitations of rapprochement efforts. Turkish displeasure reportedly also was expressed to Russia's charge d'affaires over pictures of senior Russian officers in Afrin wearing YPG insignias on their uniforms. Moscow's deepening relations with the Syrian Kurds are causing growing unease in Ankara. Foreign ministry spokesman Muftuoglu also called on Moscow to close the political offices of the PYD in the Russian capital. Ties could be further strained with Moscow lobbying for the inclusion of the PYD at next week's U.N.-sponsored Syrian peace talks in Geneva. Ankara has been at the forefront of trying to block their participation, asserting that the PYD is a terrorist organization. Russian Foreign Minister Sergei Lavrov said Wednesday that it is very important to overcome Turkey's resistance and include the Syrian Kurds in upcoming talks.